In last few months,many pro-bloggers mentioned that Blogger team is working hard for the betterment of blogspot platform.If you are also using Blogger platform for blogging then there is a good new for you because Blogger team has officially released an improvement in Blogger Template Editor.Normally we use Blogger Template editor for the customization of our template but the old editorwas that much user friendly.However new Blogger template editor is equipped with lot of features.In this post,we will discuss all features in details. How to Make use of New Blogger Template Editor? What are the features of New Blogger Template Editor? New Blogger Template Editor has the facility to highlight a particular line where error has occured.Thus it makes the error findings very easy.Earlier it was very difficult to find the error line after getting an error like “Error parsing XML, line 297, column 3””.It is a nice feature.Actually most of the html editor softwares like dreamweaver contains this kind of facility but it was missing in blogger.Now blogger also has this facility which is quite nice. Syntax Highlighter is another awesome feature which has been introduced in new blogger template editor.It allows users to understand the code easily by highlighting the codes with different colors. New blogger template editor provides you the facility to expand or hide different section of code.It means you can easily hide a section of code which is not in use.It makes the task of developers much easier because sometimes it creates confusion and they write codes on wrong sections. Now you can preview your templates after making changes in template and that too in same place.Normally this kind of functionality is known as WYSIWYG(What You See Is What You Get) and is often employed by softwares like Adobe Dreamweaver.Now the same facility is available in Blogger as Well. Now there is no need to search your widgets through their IDs or Names.You can directly find their code by clicking on respective widgets.To do the same,simply click on “Jump to Widget” option.It will open a drop down menu where you will have to click on any specific widget. 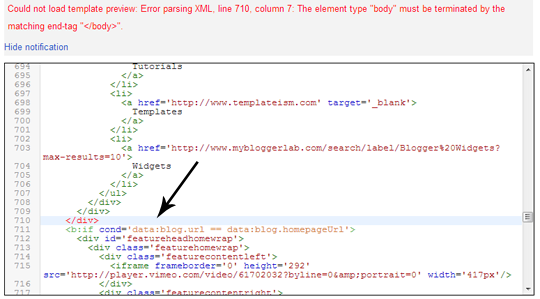 In old Blogger Template editor,there were a checkbox at the top with title “Expand Widget”.Now it has been removed.It place has been taken by “Format Template”.So if any tutorial asks you to expand widget then simply click on “Format Template” button.It does exactly the same task. It is a nice enhancement and I really loved it.Blogger doesn’t allow you to revert back to the old editor so you don’t really have any option.Just try to understand these features and work with it.I am sure that you will love these features as well. Don’t hesitate to share your views about this enhancement with us through your comments.